Designed to satisfy every customer every time. From the most exclusive luxury to family vacations. Melia's seven brands guarantee quality through their personalized guest satisfaction programs. 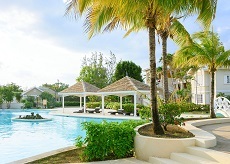 Discover Jamaica with the astonishing Melia Braco Village! This all-inclusive resort is perfect for families, friends, and couples seeking a relaxing getaway with excellent entertainment. Situated on a secluded beach, just 45 minutes away from the Sangster International Airport, Melia Braco Village is an intimate hotel with big luxuries. Lounge by the pristine stretch of sugar white sand beach, aside the crystal clear Caribbean waters. There, guests have access to a variety of water sports and activities including snorkeling, sailing, and more. Enjoy ocean views from the two outstanding pools with swim-up bar and towel service. Additional daily activities, include access to basketball courts, a football patch, and the gym. Children are treated like VIPs at the Kids & Co. club, where they can experience supervised fun specializing in cultural and sporting activities. The most recent addition to the resort, an adventure park, features exciting activities like zip-lining, rock climbing, a trampoline court, paintball, laser tag, and more! Perfect for ages six and up, the park is open daily to 45-50 people at a time. Visit with a group and take advantage of special private hours (prior notice required). Indulge in delicious cuisine without leaving the hotel at any of the five restaurants on-site. The O'Grille offers authentic Jamaican grilled specialties, Nikkei serves up Japanese and Cantonese fusion cuisine, and Rasta Pasta offers a blend of traditional and modern Italian favorites. After dinner, guests are treated with nightly entertainment including live music and a piano bar. For those seeking the upmost luxury, The Level offers the most luxurious rooms with ocean views and complimentary Wifi internet access. Also, guests of The Level receive access to a private lounge with a private check-in, personalized concierge services, access to an additional restaurant, exclusive spa access, and private areas ideal for families, couples, or groups. New packages are also available for your upcoming wedding or honeymoon. Say "I Do" in paradise with a customizable package and create memories that last a lifetime! 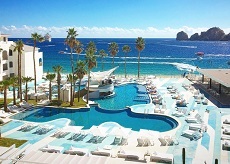 Located on Medano Beach, only steps away from Downtown San Lucas, the Marina, and nightlife, ME Cabo is the only beach resort with a focus on HIP. The internationally acclaimed Mediterranean-style Beach Club creates signature cocktails and features a culinary interpretation of Asian and Mediterranean dishes. This hip beach club also features seaside Polynesian day beds, fire dancers, DJs, weekly fashion shows, and a daily happy hour from 11am-1pm. The Rose Bar, one of Cabo's most arousing night scenes, is open Thursday to Saturday from 9pm-2am. The 151 beautifully appointed rooms and suites feature breathtaking views of San Lucas bay and the beach, modern furnishings, and exquisite amenities. The days and nights are full of indulgence with a unique ambiance that includes lounge DJ music, a wide array of activities, and watersports. YHI Spa is dedicated to purifying the body, balancing the mind and elevating the soul. The numerous spa treatments use the most prestigious products to balance, revitalize, and energize. Features include a hydrotherapy ritual center, relaxation center, and a workout room. A warm Bahamian welcome awaits at the spectacular and newly renovated, All Inclusive Melia Nassau Beach Resort. Situated on a 1,000-foot stretch of Nassau's pristine Cable Beach, this family friendly resort is the perfect place to unwind. The optional all-inclusive plan lets you indulge without a care. Only ten minutes from Nassau International Airport and downtown, the hotel is convenient to all major island attractions and shopping. The resort is nine stories high, with every room offering its own balcony or terrace from which to enjoy the Bahamian breeze in complete privacy. All of the guest rooms and suites offer inspiring views of the Atlantic Ocean or the seven-acre waterscape and lush gardens. Upgrade to The Level for the most exclusive services and amenities, including access to a private lounge, and upgraded room or suite, and special concierge service. Experience a paradise for the palate. Savor exquisite Italian cuisine at Aqua, sip on a tropical drink at Edgewater Bar, or dine beachside at O'Grill. Restaurants including Cilantro, Nikkei, Black Angus, and Estavida will take you on a culinary adventure from Mexican and Japanese dishes to steak and tapas. With a Starbucks Coffee Shop onsite (extra charge) and additional local restaurants nearby, ranging from casual to fine dining, there's something for everyone. If you prefer to stay in, room service is available. Recreational activities are plentiful, and even children can get into the action with the Kid's Club for children between the ages of 3 and 12. Catch up on your golf game or explore the colorful shops, historic sites, and bustling nightlife of downtown Nassau. The resort is set on seven exquisite acres of stunning waterscape. 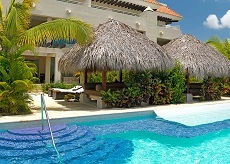 Enjoy three freshwater pools with flowing waterfalls, a swim-up bar, and whirlpools nestled among tropical landscaping. Prized for its sheltered harbor, Nassau has preserved its treasured history so visitors can see firsthand what life was like in 18th-century Bahamas. Visit Victorian mansions, cathedrals, weather-torn fortresses, and the Queen's Staircase, where 66 steps lead to a magnificent lookout. Nassau is a shopper's paradise, offering everything from local and international crafts to fine jewelry and perfumes. 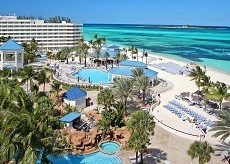 At the Melia Nassau Beach Hotel, everyone in your family will find their slice of heaven. 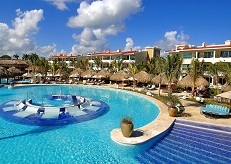 Paradisus Cancun Resort offers the elegance and comfort seen in some of the most prestigious hotels in the world. It has been awarded the AAA 4-Diamond Award since 2006, and is well-known for its white sandy beach overlooking the Caribbean Sea. Located 15 minutes from Cancun's International Airport, a fun-filled vacation is not far away. Cancun's downtown is 20 minutes away, and only 5 minutes from a complete shopping center. The resort also features four spectacular pools, specialized à la carte restaurants, a kid's club, Family Concierge, Royal Service, a 9-hole par 3 golf course, and a lit tennis court. Non-motorized watersports are available at Aqua World nearby. Paradisus signature Royal Service Suites offer unparalleled all-inclusive luxury in an exclusive and private environment for adults-only. Throughout guests' stays, personal butlers are there to cater to every need. The Royal Service lounge features private check-in/out, a library, complimentary Internet access, daily continental breakfast buffet, snacks, coffee and premium beverages throughout the day, and evening cocktails and hors d¿oeuvres. There is also a private pool with a bar. Come and enjoy pristine sands, sparkling surf, and divine cuisine. Combining a delightful Caribbean setting with world-class facilities, Paradisus Palma Real Golf & Spa Resort features world-class spa facilities and treatments, a two-story health center with advanced work-out equipment, a large beachfront free-form swimming pool, and is just a few minutes away from The Cocotal Golf and Country Club and Palma Real Shopping Village. 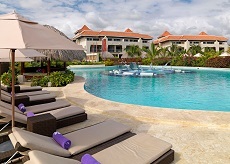 Paradisus Palma Real Resort is located on beautiful Bavaro Beach and is surrounded by lush, vibrant tropical gardens, mangroves, and sparkling waters. Guests can explore their senses on a culinary tour through eight remarkable dining experiences featuring delectable cuisine. Unlimited international premium brand drinks are available in nine different bars. A lively entertainment program will ensure that each day is filled with exciting activities. The night comes to life with the casino, chill-out lounge, and live music. The perfect vacation for a golf enthusiast, guests at Paradisus Palma Real Golf & Spa Resort can enjoy top-notch golf. Cocotal Golf & Country Club is a 27-hole world-class championship golf course sure to challenge the most advanced golfers. The Reserve section of Paradisus Palma Real Golf & Spa Resort offers both adults and families a VIP experience like no other. Royal Service Suites are adults-only and provide a superb luxury experience. Butlers are there to tailor and customize to each guest's needs. Family Concierge Suites are perfect for those looking for a fun-filled family vacation. There are exclusive family activities such as a sand castle workshop, connecting rooms available (fee), and a milk and cookies turndown service for kids. Located in a stunning little bay, Paradisus Playa del Carmen La Perla is a superior adults-only (18+) luxury resort in the Riviera Maya, combining a prestigious Caribbean setting with world-class facilities, Royal Service, the ultimate in spa treatments, and a relaxed ambiance. Nearby is famous Playa del Carmen's 5th Avenue as well as archaeological sites such as Tulum, Chichén Itzá and Coba. Take your senses on a culinary tour through 14 remarkable restaurants serving delicious cuisine from all around the world. Enjoy fine, elegant meals by 7 Star Michelin Chef Martin Berasategui. The 16 bars serve unlimited international premium brand drinks. Enjoy life-enriching experiences such as tango dance classes, sushi-making, and sensorial experiences. YHI Spa is a 19,267 sq. ft. full-service indoor spa with a beauty salon and a state-of-the-art Health Club. There are also one-on-one wellness programs designed to meet your mind and body goals. 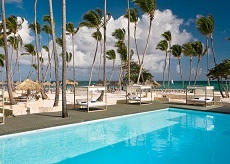 Paradisus Punta Cana Resort is a luxury all-inclusive eco-resort with a welcoming atmosphere that caters to the whole family. This resort introduces new innovative and reinterpreted dining concepts, YHI Spa, and a state-of-art gym, newly refurbished Royal Service Suites and pool, and the Nova Theatre, with new seating and the best in digital lighting and surround sound. 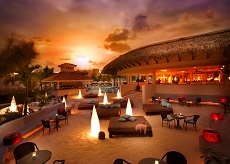 Paradisus Punta Cana Resort is the only all-inclusive resort in the Caribbean with 11 restaurants, nine bars, 24-hour room service, daytime and evening activities and entertainment, a casino, a world-class spa, and an Action Park with batting cage, archery, bicycles, and a climbing rock. Cocotal Golf and Country Club is located just 10 minutes away from the resort and offers free shuttle service. The Reserve is a resort-within-a-resort, offering exclusive access to separate, sparkling new pools for kids and adults, a private lounge, and an all-new, all-luxury collection of 180 oversized Paradisus Resort suites. The Royal Service Suites are adults-only (18+) and feature a Jacuzzi, separate check-in/out, concierge, and a private lounge serving breakfast and drinks. 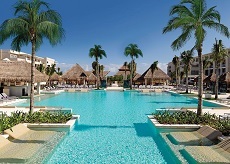 The resort also features 48 signature Paradisus Family Concierge Suites, renowned for their comfort and irresistible array of family-friendly amenities. Melia Caribe Tropical sets the standard for all-inclusive resorts with The Level, where we take care of everything down to the smallest details in order to make your stay a magnificent experience. Set on the spectacular Bavaro Beach, this resort offers impressive facilities to help you make the most of your family vacation, friends' getaway, or romantic retreat. Guests of The Level can enjoy this massive resort as a whole, or the smaller feel of this resort-within-a-resort. Enjoy access to ten fabulous swimming pools, a casino, golf course, and gymnasium. Enjoy access to the VIP Lounge, where you will enjoy continental breakfast, complimentary Internet access, coffee and tea service, premium drinks, and snacks throughout the day. Experience the GABI Club, which features its own swimming pool, bar, and restaurant exclusive to guests of The Level. On the beach, you'll enjoy a private section with Bali beds and drinks service on the beach. Let our skilled staff take care of your every need, with butler service, concierge service, and an aromatherapy menu. For a quieter vibe, book The Level Adults Only section, where you will enjoy a privileged location exclusively for adults. Enjoy fine dining every night, with preferred status when booking a reservation. Ten a la carte restaurants offer everything from Mediterranean to French to Asian cuisine. Guests of The Level Adults Only enjoy exclusive a la carte dining with International cuisine at Cuatro, while guests staying at The Level (not including The Level Adults Only) enjoy exclusive access to a la carte dining at GABI Restaurant. Activities are in full supply at Melia Caribe Tropical, with non-motorized watersports, mini-golf, aerobics, and dance classes. Children can participate in a variety of supervised activities throughout the day, while parents unwind at the YHI Spa. 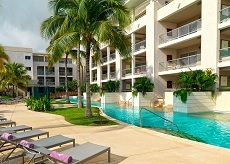 Allow The Level at Melia Caribe Tropical to make your vacation memorable! Families staying at the Paradisus Palma Real will want to stay in The Reserve, an all-inclusive boutique resort-within-a-resort designed to accommodate the whole family. Located on magnificent Bavaro Beach, The Reserve is surrounded by tropical gardens and offers exclusive access to a private beach with concierge service. Those staying in the Family Concierge rooms will have a specially assigned Family Concierge who will help coordinate all services and activities for the entire family. Families will enjoy three pools, one of which offers a children's pool with slides and a paddling pool for the youngest family members. A fully equipped Kids Zone is available for children ages 1 to 12, so parents can take time to relax in the YHI Spa. A full program of activities is available, including workshops, musicals, evening shows, and live music. Golfers will enjoy the Cocotal Golf & Country Club just minutes away, while shopping is nearby at the Palma Real Shopping Centre. In the evening, the hotel offers lively nightlife, activities, shows, and live music. 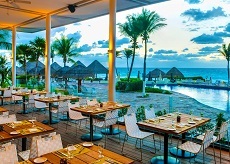 At The Reserve at Paradisus Palma Real, specialty restaurants await to satisfy your every craving. At Mizu, the chefs will surprise you with their shows, combining performance with Japanese cuisine. Enjoy a la carte Mediterranean cuisine at Aqua, with a selection of salads, soups, pastas, fish, meat, and delicious desserts. For lunch, Hydro Grill offers a variety of snacks, light lunches, and tapas by the pool. For a stylish setting with relaxing, cutting-edge architecture, enjoy international cuisine at Gabi Club. No matter your age, everyone is sure to find excitement at The Reserve at Paradisus Palma Real! The Reserve at Paradisus Punta Cana is a new all-inclusive boutique resort-within-a-resort designed to accommodate the whole family. Located on the world-famous Punta Cana Beach, this hotel provides access to endless fine white sand and crystal clear waters. The coral reef protects the waters, making the sea calm and perfect for children to swim. In addition, the resort offers a spectacular swimming pool as well as a children's pool with slides. A fully equipped Kids Zone is available for children ages 1 to 12, so parents can take time to relax in the YHI Spa or enjoy a daily program of activities, including workshops, musicals, evening shows, and live music. Golfers will enjoy access the Cocotal Golf & Country Club. In the evening, the hotel offers lively nightlife, activities, shows, and live music. Those staying in the Family Concierge rooms will have a specially assigned Family Concierge who will help coordinate all services and activities for the entire family. At The Reserve at Paradisus Punta Cana, specialty restaurants await to satisfy your every craving. For a stylish setting with relaxing, cutting-edge architecture, enjoy an international buffet at Gabi Club. Some evenings, Gabi Club offers a la carte dining. For lunch, Hydro Grill offers a variety of snacks and light lunches by the pool. Experience contemporary Mediterranean cuisine at Vento, an a la carte restaurant which highlights the gastronomic art found in olive oil, bread, and wine. Call your Vacation Specialist at (405) 212-4545 TODAY! (405) 212-4545 or (877) 201-9444.